The European Insurance and Occupational Pensions Authority (EIOPA) has been tasked by the European Commission with establishing a new framework for the Europe-wide regulation of pension schemes – IORP 2. The most controversial aspect of their consultation work to date is the calculation of scheme solvency and how best to include a quantitative estimation of the value of sponsor support. Much media coverage has already focused on the additional costs that might need to be incurred by sponsors and speculation about how this project, if implemented badly, could serve as the final nail in the coffin of defined benefit provision as a living and vital part of the employee package. EIOPA has just released preliminary results of its Quantitative Impact Study (QIS) – an attempt to quantify the impact of the currently proposed framework – which provides plenty of information to get our teeth into in assessing possible outcomes. This paper provides a brief summary of the top-level deficit estimates that would impact UK occupational schemes. It is worth noting that EIOPA’s data was taken as at the end of 2011; since then the FTSE All-Share index has risen some 18% whilst 10yr gilt yields have declined by some 30bp – this will have impacted scheme funding levels, probably beneficially in most cases. 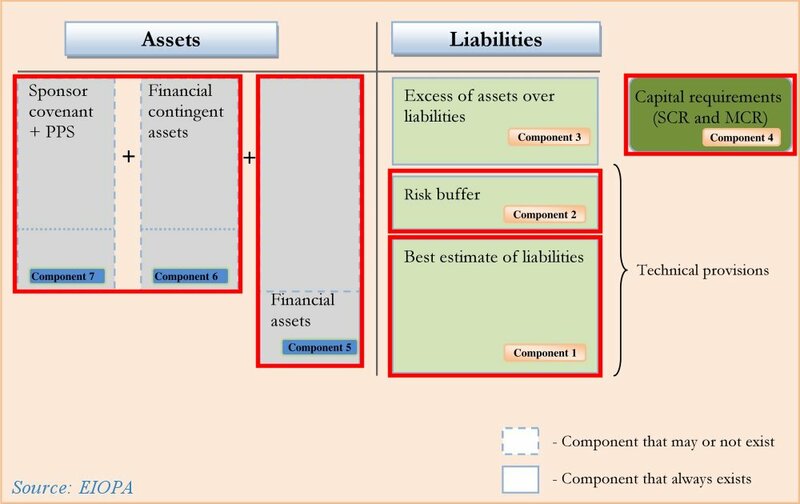 The graphics below illustrate EIOPA’s vision of the holistic balance sheet – an attempt to put all relevant asset and liability contributions onto one page on a mark-to-market basis. 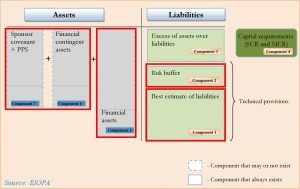 This approach and in particular suggestions that it be used to drive the regulation of the solvency of pension schemes is controversial – some commentators argue that mark-to-market for liabilities is not appropriate or that the balance sheet may be a good model for analysis but not for regulatory oversight; nevertheless we believe that it at least can provide a useful structure within the aims of this paper. 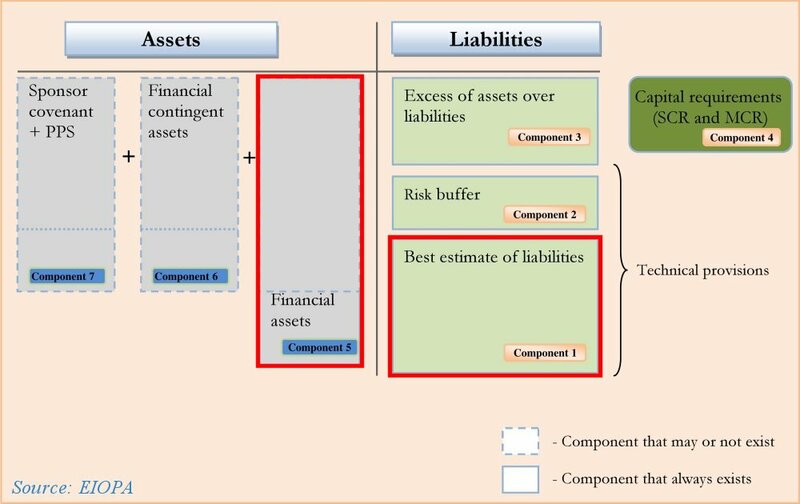 EIOPA refer to Components 1 & 2 in combination as ‘technical provisions’. Definition of this calculation varies across Europe and so this isn’t the same as our usage in the UK. It is clearer to consider Component 1 as reflecting UK technical provisions , with Component 2 being the assessed liability uplift required for consistency with a gilts or swaps discount rate. 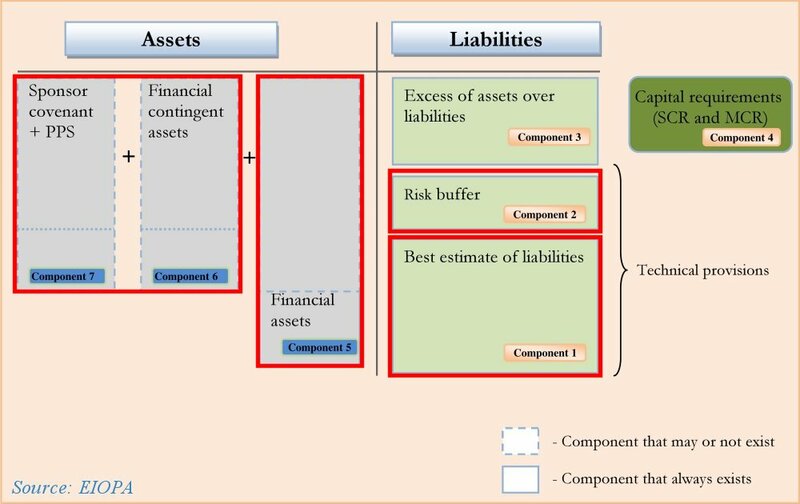 Component 4 does not really belong in a static balance sheet with the other items forming the mix of assets and liabilities at a single point in time. Component 4 refers to a prudential add-on which reflects the maximum likely decline of the solvency position over a subsequent one-year time horizon. Including this would bring pension solvency analysis in line with the Solvency initiative for insurers and Basel for banks. Components 6 & 7 distinguish between sponsor support conditional on ability to pay and support which is pledged and protected in the event of bankruptcy – for instance the Recovery Plan would be a Component 7 asset, where contingent assets would be included in Component 6. This familiar scenario gives a quickly recognisable outcome in the QIS, with an asset shortfall over assessed liabilities exceeding assets of just over 20% – this would be balanced in our existing regulatory framework by the inclusion of the Recovery Plan. This scenario seeks to integrate the balance sheet concept by including a fuller assessment of sponsor and PPF support as well as shifting to a risk-free discount rate for current liability values. EIOPA acknowledges that sponsor support is a finite resource and, as a result, the final funding deficit under this scenario comes to approximately 15% or €292bn (approx £250bn) as this support has been exceeded. Once we add a further capital buffer into the calculation, the final funding deficit under this scenario comes to approximately 24% or €527bn (approx £450bn). Early media coverage has focused on the £450bn shortfall number as an additional cost that UK plc will need to contribute to bolster defined benefit pensions. However, this eye-watering number (well above, for example, the £375bn total size of the Quantitative Easing program) is not only above sponsors’ willingness to pay, but also above their ability to pay. As such, it is clear that the consequence of implementing these proposals would be entirely counter to the Government’s aim of promoting economic growth and contradictory to the aims of the Chancellor’s objectives in amending the remit of the Pensions Regulator as introduced in the recent Budget. We believe that the Holistic Balance Sheet is a valuable diagnostic and risk management tool and, in particular, the new quantitative focus that it places on the sponsor’s practical ability to provide support. This area will reward further attention, particularly consideration of the split between investment risk and sponsor risk for the scheme. However, this approach is not generally appropriate as a model for imposing funding arrangements across the board. It would force pension schemes to adopt a solvency model rather similar to insurance companies and therefore align funding and investment policy with a theoretical approach to buyout which will be inappropriate for many, if not most schemes. The partnership between sponsor and scheme should be permitted to support a longer term diversified investment strategy. Any QIS impact analysis ought also to include an assessment of the economic value lost to employees and sponsors of perfectly viable schemes that could be forced to close – to new members or to future accrual of benefits – and compare this to the pre-emptive savings made in identifying and managing weak schemes now rather than allowing them to struggle through into the future. We anticipate publication of the final QIS report in mid-2013. Babies and bathwater, anyone? Please do leave comments and feedback below.